It is the mission, duty, and purpose of Zeus’ Rescues to eradicate pet homelessness and euthanasia within the New Orleans metro area. The organization is further committed to community-building and pet education with a focus on children and the elderly. We find forever homes for animals that are pulled from high kill metro shelters. We are not an in-take shelter. We are an all-volunteer group funded by private donations and grants. We receive no local or state public funding. Check out our available adoptable pets! You are welcome to visit the rescues daily from 10am-4pm. Click on any pet to see more information about them. Fill out the online adoption application and get preapproved! Fat Tuesday at the Rescue! WE NEED YOUR DAILY VOTES! Great events you should attend! 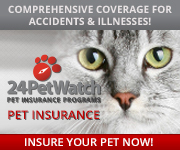 Every adoption from Zeus' Rescue includes a free 30 day trial of pet insurance via 24PetWatch!